You wanted the littlest, you got the littlest. 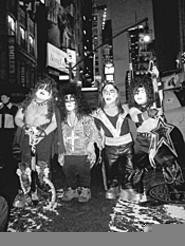 They rock and roll all night, and party every day -- but they need a little help when the cold gin's on the top shelf: It's Mini Kiss, the world's premier all-midget Kiss tribute. The classics are full-sized, but the cover charge is a fraction of the price to see the real deal. And as for the Mini Demon's tongue, well, you'll just have to see for yourself.